Laurel Valley Soils owes a large degree of its prosperity to the continued growth of the green-building movement. | Photos by Jared GruenwaldIt’s a bright mid-summer day in the rural Chester County borough of Avondale, which sits just a few miles north of the Delaware state border off Route 1. Tucked behind the winding, two-lane road known as Penn Green is a vast manufacturing facility spread out over what seems to be an endless tract of farmland. This is Laurel Valley Soils. 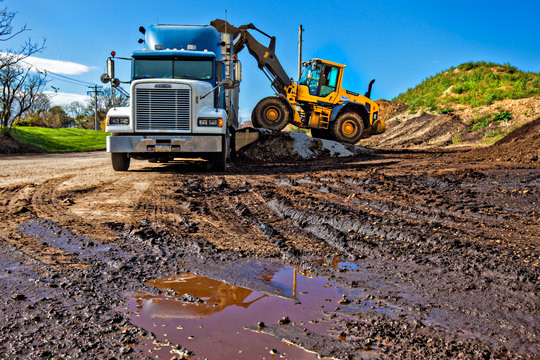 LVS is a producer of compost and the facility itself consists almost entirely of heavy machinery and endless mounds of steaming dirt. Between the bulldozers and the dirt sheds and the neatly arranged windrows of soil that stretch on as far as the eye can see, nothing less than the very ground floor of the ecologically sustainable construction industry is being built on these 125 acres. Today, the region of Chester County that Laurel Valley Soils calls home is known as the Mushroom Capital of the World. The neighboring historic town of Kennett Square has brought worldwide attention to this small corner of Southeastern Pennsylvania, where more than half of the nation’s mushroom crops are grown. As the mushroom’s popularity continued to bloom in the early 1980s, Laurel Valley Farms—the soils division’s 40-year-old parent company, which produces a unique compost used exclusively by regional mushroom farmers—found itself saddled with a problem. Because mushroom compost is capable of producing just one single harvest, mountains of the nutrient-rich soil were beginning to pile up on neighboring farmland, where it was discarded. “Laurel Valley Farms realized that they needed to figure out how to turn that waste stream into a value-added product—to close the loop with a cradle-to-grave [solution],” says Jake Chalfin, the company’s 36-year-old sales manager. Chalfin was only 24 when he joined the Laurel Valley team. “It was just dumb luck,” he says, that the company was gearing up to launch its soils division when he dropped off a résumé. Although he’d grown up in Chester County, Chalfin knew next to nothing about the mushroom industry at the time. Compost, though, was a different matter. 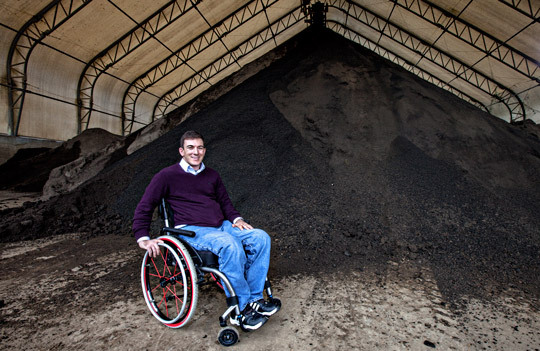 As Laurel Valley Soils’ sales manager, Jake Chalfin is the public face for the incredibly successful soils division. As the firm’s sales manager, Chalfin is now the public face of Laurel Valley Farms’ incredibly successful soils division, which was specifically developed as a solution to the company’s growing waste stream of used mushroom compost. As Chalfin explains, Laurel Valley Soils, as the division is called, owes a large degree of its prosperity to the continued growth of the green-building movement. That’s because the compost in which mushrooms grow happens to be a very high-demand product in the organic gardening and sustainable landscaping industries. So, after collecting and processing the compost from what are now 12 of the country’s largest mushroom farmers in Chester County, Laurel Valley Soils then sells the enriched dirt to builders and gardeners. In Philadelphia, the Pennsylvania Horticulture Society is one such client. For its PHS City Harvest program, in which more than 130 urban gardeners donate fresh produce to local food cupboards, growing organically is a strict mandate. “We were looking to find a source of compost that meets all the organic certifications,” says PHS project manager Eileen Gallagher, explaining the nonprofit’s decision to purchase Laurel Valley’s mushroom compost and topsoil blends. 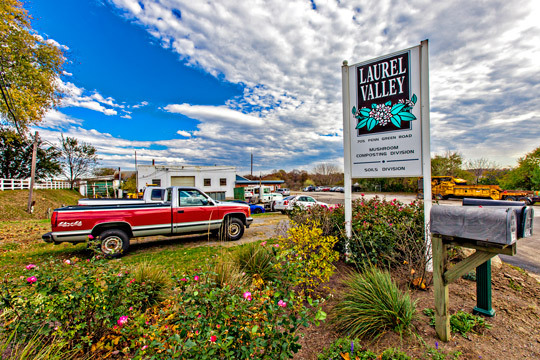 Laurel Valley’s soil blends are also used by turf management firms and landscapers who need a product that will manage stormwater retention. A decade ago, the company’s compost was laid atop a baseball field in the West Chester Area School District. Last year, its enriched topsoil was used during a renovation of the Merion Golf Club’s driving range. That topsoil is one of about 16 different products Laurel Valley offers. It’s stored out of the elements to produce a dry soil that keeps the enriched nutrients intact. Laurel Valley even custom-blends a unique soil mixture produced by Rooflite, a sister company, that’s designed specifically for use on green roofs; it’s been used on projects at Swarthmore University and at Pittsburgh’s Carnegie Mellon University. The “Certified Green Roof Media” is lightweight enough to minimize the load on the roof, but heavy enough not to get blown away by wind or water. It’s also aerated in such a way that root growth can be successful (it’s nutrient-enriched), and yet at the same time it retains rain water and drains excess water. Chalfin says that, including greenroof soil, bio-soil, rain garden soil, compost, garden soil and some other “fringe products,” Laurel Valley probably produces around 125,000 cubic yards—or 50 percent of their sales—for “green projects.” It’s been so successful at marketing the spoils of its mushroom compost that a major expansion of storage space is currently underway.